On the left is Athol Mulley, visiting his old friend George Podmore. Both were in ill health at the time, but had a pleasant few hours together, according to Margaret Podmore who sent me the photo. Athol “George” Mulley died in 2001 at age 78, while “Poddy” was 79 when he passed away in 2005. Mulley is best remembered for his spectacular 15 win streak on the champion Bernborough in the mid 1940’s, but won many other high profile races. He won three of the first eight Golden Slippers, two AJC Derbies, three Epsoms, four All Aged Stakes, four Rosehill Guineas and three VRC Newmarkets. He was champion Sydney jockey twice, and runner up on three other occasions. 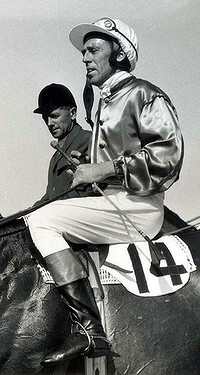 Like George Moore he missed out on a Melbourne Cup, with a second placing on Prince Darius in 1957 the closest he got. George Podmore, on the other hand realised the dream of every Australian jockey, by winning the Cup on the wonderful mare Evening Peal in 1956. The pair had combined to win both the VRC and AJC Oaks, in the previous season.”Poddy” enjoyed tremendous success on the long striding grey Martello Towers in the late 50’s. The pair pulled off a unique quartet of wins in the Spring of 1959. Martello Towers won the Hobartville Stakes, Canterbury Guineas, Rosehill Guineas and AJC Derby on the trot, leading throughout in all four. He won four races on the great mare Wenona Girl. Podmore spent the last thirteen years of his riding career in Singapore, where the humid climate greatly assisted a rheumatoid arthritis condition, which caused him great distress in his later years. Neighbours peeking through the shutters on that sunny morning at Robina, would never have dreamed that the two little blokes on walking frames were major players in a golden era of Australian racing.